Was losing weight one of your resolutions this year? It’s definitely one of mine. I need to lose my last 15 lbs. I started my weight loss journey in early 2012 and I can’t believe it’s been over a year! I’m over 50 lbs lighter and feel motivated to continue on. My grandma always used to say that your thoughts matter and you need to “think yourself thin”. She believed in the power of positive thinking. She was a smart lady. According to the Kellogg’s Special K Canadian Positivity Poll, 97% of Canadians agree that a positive attitude helps in achieving your goals. On the flip side though, only 48% consider themselves positive. I know I try to be positive, but it’s a constant battle to keep the negativity and self-doubt away. Thinking positive thoughts does help keep me in the right frame of mind to achieve my goals. Hina Khan, a psychotherapist, TV personality and Special K Ambassador has some tips on how to think more positively. 1. Catch negative thoughts before they take over and don’t feed them. Dismiss thoughts like “I’ll never achieve my weight management goal”. 2. Reframe thoughts to the positive. An example is, “I get to go the gym vs. I have to go to the gym”. 3. Live in the present and don’t dwell on the past or worry about the future. Focus on the now instead. 4. Surround yourself with positive people. The Special K research showed that women who lost or maintained weight were three times as likely to rely on friends as a form of support. 5. Remember the external world is a perception of your internal world- which you can control. The Special K research also found that women who think positively about weight management were more likely to put a stop to negative conversations about their own or others bodies. Along with positive thinking, there’s another valuable resource that I wanted to share with you today: My Special K. It’s an online program that will aid you in your weight loss efforts through personalized meal and fitness plans and information about food, fitness, fashion, beauty and more to help you get to your goal. 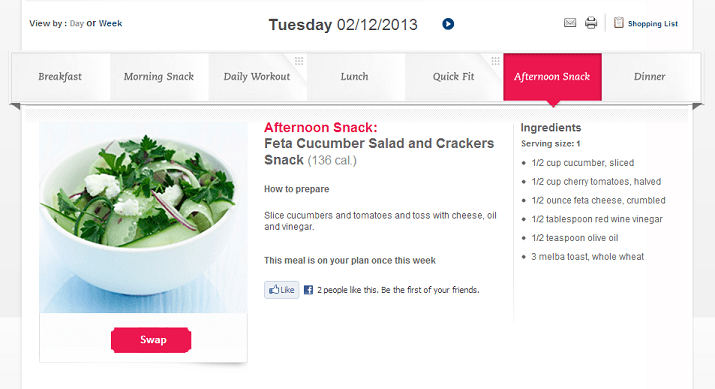 The personalized meal plan is really neat! It tells you what to eat and when and gives you the recipes. Even if you don’t follow it 100%, it will give you lots of ideas on healthy food choices and recipes to try. It also tells you what to do for your daily workout. For instance, today mine is go for a 30 minute walk. You can journal your progress to keep track of your experience as you go directly on the site. It’s an excellent resource if you feel like you are floundering in your weight loss goals and need some direction. I remember what it was like when I first started. I barely knew where to even begin. I also had a chance to try some Special K snacks and cereals. For a quick snack in between meals, try Special K Strawberry Flavour Fruit Crisps or Special K Chocolate Flavour Crisps. They are only 100 calories for two Crisps! 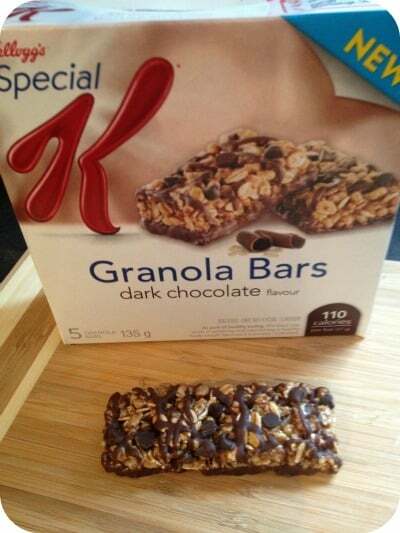 There’s also Special K Granola Bars in Dark Chocolate. They are only 110 calories per bar and perfect to satisfy a sweet tooth. 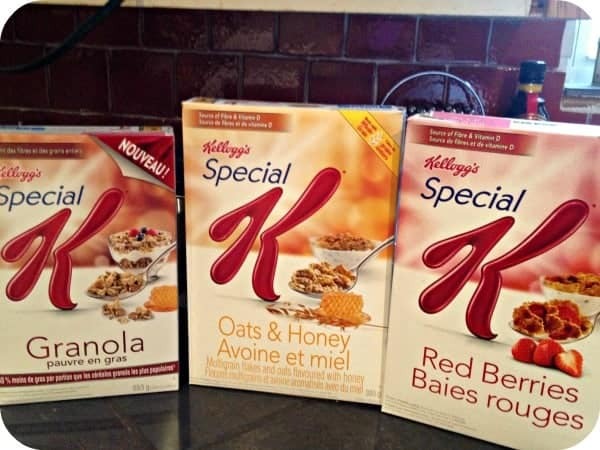 For breakfast, Special K makes it easy to keep on track with their cereals: Special K with Red Berries cereal, Special K Oats & Honey cereal and Special K Low Fat Granola cereal. My favourite is the granola. I add it to some plain yogurt in the mornings. Have you set any weight loss goals this year? I have been on that journey for a few months now! The best thing I did was get rid of 98% of the processed food we eat, I eat mostly raw fresh fruits, vegetables, one protein shake a day, joined a free cross-training class our parish libraries hold, “it’s only on wed.” so we had a zumba class started down the street and I go twice a week! In 3 months I am 25 lbs down and in clothes I thought I was going to have to donate! I love it because most of them are the cutest capris I didn’t want to get rid of and always wanted to get back into!! YIPEEEEEEEEEEE FOR HEALTHY FOOD! Congratulations on your 50 pound weight loss, that is a real milestone and one which you should be very proud of yourself for achieving. I realize again and again how important it is to surround ourselves with “positive people” on this journey. In other words, your best friend may want nachos and margaritas three nites a week after work…but she is not your weight loss friend. You have to be friends with yourself first. Much of this is encapsulated in Geneen Roth’s excellent book called “Women, Food and God”. I always make new years weight loss resolutions but never seem to stick to them. I do better anytime throughout the year when I set small goals. I usually do but then fail :/ I have about 15 lbs to lose but don’t have much motivation! I could make a weight loss resolution but I have never, EVER kept one so I don’t bother lying to myself anymore 😛 The 1st year i didn’t make a resolution, i lost 50 lbs!! Strange how things work out like that! These are really good tips. I especially like the one about surrounding yourself with positive people. That really makes a difference! I like your advice on reframing thoughts to positive. That would just do SO much good when trying to lose weight. I too am struggling with my weight. I have not tried the Special K plan, but I think I’ll head over to their sight because I’m sure they will have some good information. I have been going to Weight Watchers (I won a 3-month membership) and have lost weight every week! There’s a lot of positivity and a lot of sharing of ideas and I ended up in a good group of people. Here’s an idea for a giveaway — a Weight Watchers membership — LOL! I didnt set a specific amount to lose, because I know it would be impossible to lose as much as I need to in a year. So right now I am just trying to exercise more, eat less and focus on the day to day. The “think yourself thin” idea of your grandmother’s is such a valuable one. It’s not that you can actually just think the pounds and inches away, but if you’re always thinking “I’m so fat, I look horrible (etc. )”, you will ultimately fulfill that idea with your behaviour. Of course, despite the fact that I KNOW this objectively, I am still working on my mindset…! Thanks for the blog post, I enjoyed it. my goal this year is to go back to my pre-pregnancy weight. It hasn’t happened yet but I’m working towards it! I lost 40lbs in 7 months but have been stagnant the last 2 because of summer. Thanks for motivating me back to the groove! I need to get back to my weight loss goals… I lost nearly 30 lbs before and just after my husband and I got married… now as we near our 4 year anniversary, I have gained back every pound and then some. We want to add children to our family, but I have some goals to meet before we venture down that much desired path. My problem is motivation. I am just not motivated to start the journey again. We make very conscious healthy choices for what we keep in our house, I make sure to treat myself sometimes so I don’t binge on junk, I don’t find “fast food” to even taste good anymore so it totally isn’t desirable, and I don’t over-eat however, I have not lost a single pound with eating well (to be exact, I’ve gained 5-10 additional since I cut out the junk). I HAVE to find some good motivation to get going. What was your motivation to go all the way and get going? One of my main motivations was my upcoming wedding. I also noticed that once you see the pounds coming off its easier to keep going. Starting is always the hardest, but you just have to remind yourself why you are doing it and stay focused on your goal. It got easier for me. I’m down 60+ lbs now and almost there! I lost about 40 lbs before and kept it off of awhile I was really motivatied. Well gained it back and now wish I could get motivated again but just cant seem too anymore. Thanks for your story an all the good tips you gave. Loosing weight was not one of my resolutions this last year, but I think it is going to be this coming one! Love the resolutions – we all need those little reminders!! Congratulations on such a tremendous weight loss!! I’m terrible at sticking to resolutions, and even worse at sticking to diets. Wish I had that motivation!!! I’ve been trying to loose 25 pounds for a little while now, it seems to just want to be staying on. Reading this has helped me become more motivated to keep at it and I will see the results. Thanks. resolutions for me awe there for the birds I can never keep one past the end of Jan.